You can measure many aspects to email using your CRM, each of which should guide your future marketing efforts. These are a few important statistics you can track to learn what is working and why. Also known as an open rate, your read rate is the number of people who opened your email compared to the total number of valid recipients. This percentage tells you who loaded images in the email they received. Your open rates reflect why design, content, and a clean contact list are critical. If recipients see a lot of value in loading the images and trusts you, they click to view those images. The image below shows a summary of percentages of results from an email broadcast. Note that you want to compare these figures to other broadcasts you have sent, and similar broadcasts that other businesses send. Your ESP should be able to provide those benchmarks for you. Summary of percentages of results of an email campaign. Your click rate is the number of people who clicked a link in your email divided by the number of valid recipients. The percentage of clicks lets you know how engaged people are with your content. The more clicks, the more you drive them to your website and toward conversion. Connected to tracking your click rate is the effectiveness rate. This rate is the number of clicks divided by the number of reads. It tells you how compelled your interested readers were to click your links. Check out the click-related information for an email campaign in the image below. In this case, you can see how many times a link in the email was clicked. Your CRM should include allow you to drill into any part of the chart to get detailed information about who took action on your email, and linking that information to that contact’s CRM record. 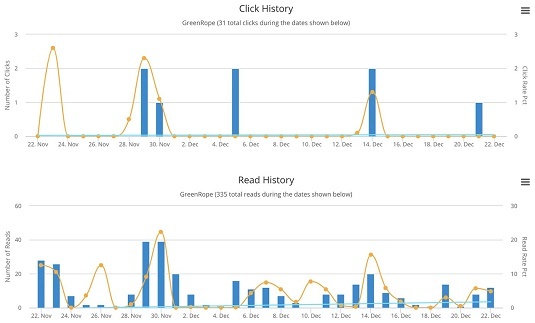 Comparing summary statistics of an email campaign. Here, you can see additional useful data. The top chart shows the activity over time, which is an indicator of how fast people take action. 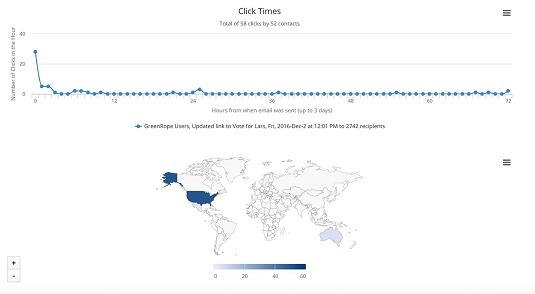 The bottom chart shows the geographic distribution of clicks from the campaign. A report showing when and where email was opened. Your unsubscribe rate is all about list quality and your emailing practices. If someone unsubscribes, you can never email her again, unless that person signs up again. Never reset an unsubscribe, unless you’re absolutely certain the person made a mistake, and you had a conversation to confirm intent to sign up again. You can incur steep financial and legal penalties for sending email to unsubscribed contacts. The quality of your list and the reputation of your mail server is reflected by your bounce rate. Your ESP should give you a summary outlining the reasons why emails bounced. 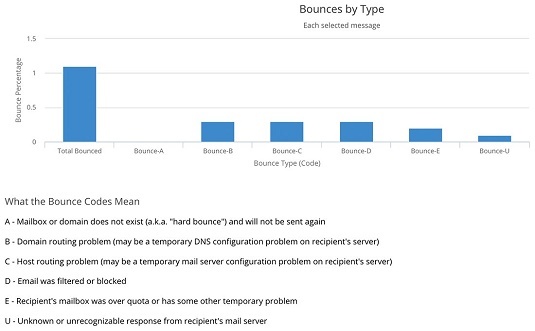 Bounces are classified as hard bounces (the email address doesn’t exist any more, or the domain doesn’t exist) and soft bounces (rejected due to a full inbox, or inappropriate content). Too many hard bounces to a domain negatively impacts your long-term reputation as an email sender, which is why you need to keep your list up to date. Summary of bounce types for an email broadcast. After an email is identified as a hard bounce, never send an email to that address again. Resetting bounces gets you flagged as a spammer by an email provider. Your marketing team should monitor statistics for both individual broadcasts, and for multiple broadcasts over time. It’s useful to look at all your broadcasts as a whole to see general trends in reads and clicks. Get the statistics for a few similar broadcasts (for example, the last several newsletters) and compare them to see whether any performed higher than others. Summary charts of click and read rates over time with trendlines. Take a look at vendor-provided benchmarks to see how you’re doing in comparison to other companies. List size is the strongest predictor of read and click rate, so your vendor should be able to provide you with relevant stats for your email list size to compare against. The image below shows a chart that can give you insight into how well you’re doing overall. If you find you’re underperforming, reach out to your ESP or your marketing team to try to figure out why. 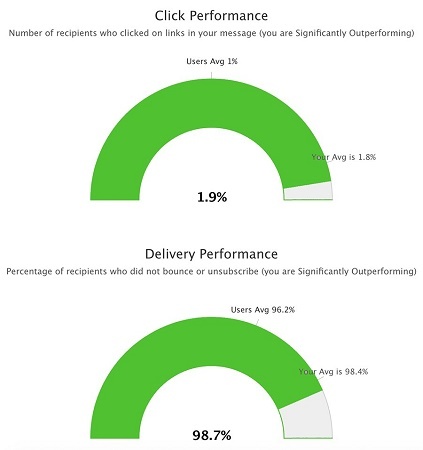 Benchmarking clicks and delivery against user averages. Scoring is a great way to help you focus on your most engaged contacts. You can target individuals by how many points they accumulated by reading, clicking, or forwarding your message. If you combine scoring across multiple email campaigns, you can target people who have shown repeated interest. When you identify your hottest leads from scoring, your sales and marketing teams both have opportunities they can take advantage of. For salespeople, a well-timed personal follow-up can reach someone when she’s ready to buy. For marketers, knowing someone is interested can trigger a follow-up email with a call to action (for example, a discount code or additional benefits) to spurn a lead to buy. This is a hot prospects chart. 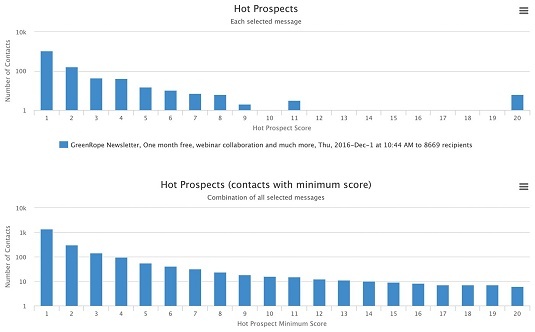 The top chart shows the contacts who took actions to score those specific scores, while the bottom chart shows contacts who had a minimum score of that number or higher. You can then isolate people based on how interactive they were with the email they received from you. Individual and minimum score histograms. Incorporate automation into your email marketing strategy. The trigger may be an individual action (reading or clicking a link), or it may be based on minimum scores, where you may want to target people who are very interested in your message. You may also want to do the opposite, targeting people who didn’t read or click your message. The actions you decide to take should be tightly integrated with your CRM workflows. Workflows allow you to update CRM data, assign contacts to campaigns, schedule follow-up CRM activities for salespeople, and more. A link click can activate a workflow. Setting up automation on emails is part of helping your contacts through the buyer journey. A lead is moving closer toward your goal of conversion, and an existing client is learning more about what you do and moving closer to becoming an advocate for your brand.